After some very insightful and excellent advice from KrautScientist, I acknowledged what had been bothering with this mini for some time - the bionic arm. So it has promptly been torn off and will be replaced with something bigger and meaner looking. 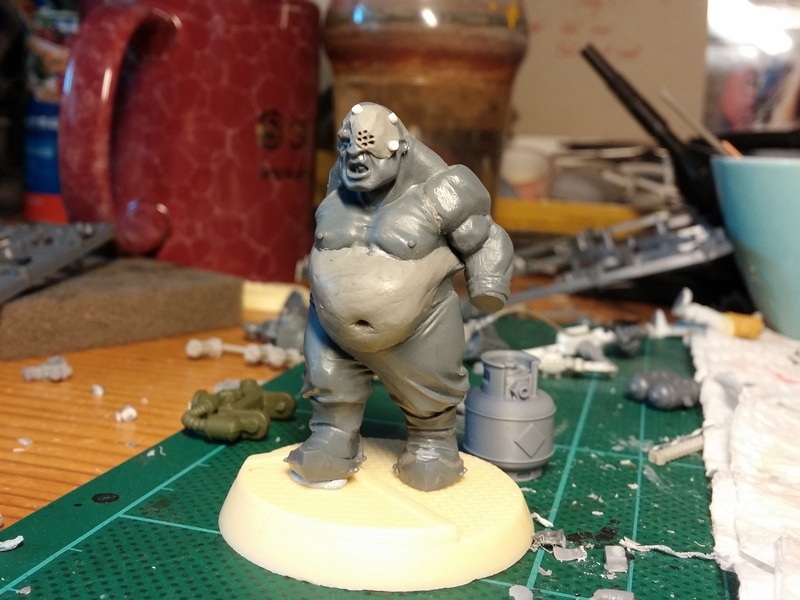 I had also decided that he was too clean, so in the same go I'll add some twists and bits, to take him to an acceptable level of weirdness and the lovely sickness that is the back-alleys of the 40th millennia. I love the head, as I think it looks really unintelligent, which fits well with the story line I have planned for this model - but missing the grimdark and twisted. So I have added a metal plate, nailed on of cause, as the first bit. Looks rather good and brutal I think. That plate on his face is great! Where did the propane tank come from? Thanks mate, the tank is from Zinge Industries.